Bank of England: I Promise to pay the Bearer on Demand the Sum of Twenty Pounds London 20 August 1932. 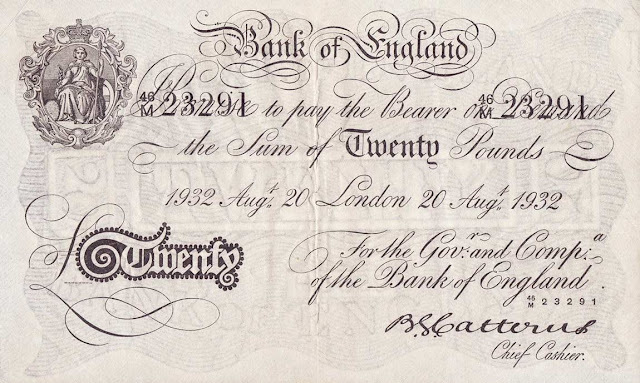 Signature: Basil Gage Catterns, Chief Cashier of the Bank of England, 1929–1934. The Bank's early notes were printed in black ink on creamy white paper. They consisted mainly of text, the only ornament being a small vignette of a seated Britannia in ornate circular frame, based on the Bank's official seal, value in black tablet low left. Until the middle of the nineteenth century there were many different engravings of Britannia, many of a poor standard which could easily be copied. In 1855 the Bank introduced a new design, with a Britannia in the style of a Saxon princess, engraved by the Irish artist, Daniel Maclise, Royal Academician (1806-1870). The printed sum block was introduced in 1743: an ornate version of the note’s denomination, or sum, in white letters against a black background. This made it much more difficult to alter the value of a note convincingly. The words "I Promise to pay the Bearer on Demand the Sum of Twenty Pounds" date from long ago when British notes represented deposits of gold. At that time, a member of the public could exchange one of our banknotes for gold to the same value. When the Bank of England first started to issue notes, back in the 17th century, they adopted Britannia as their emblem. The early large white notes and the first colour 10 shilling and £1 notes (which appeared in 1928) all featured a seated figure of Britannia on the left hand side of the obverse of the notes. These are generally referred to as Britannia or Series A notes. All Bank of England notes to this day feature Britannia somewhere within the design. Basil Gage Catterns (1886–1969) was the Chief Cashier of the Bank of England from 27 March 1929 to 17 April 1934. Catterns was replaced as Chief Cashier by Kenneth Peppiatt. He then served as an Executive Director of the Bank and eventually as Deputy Governor (1936–1945). He was the uncle of the Australian businessman, citizen soldier and amateur yachtsman Basil W. T. Catterns.